The final book in the Ahriman trilogy by John French may have came out awhile ago, but having just gotten the chance to read it, it definitely did not disappoint. What started out in Ahriman: Exile sees its closure here as the rogue sorcerer seeks to atone for his greatest folly, the Rubric itself. Picking up after the events of Ahriman: Sorcerer we find our title character coming to a conclusion about what must be done. Having secured the Atheneum in the last novel, a supposed link directly into the mind of Magnus the Red, the exile believes he has found a way to right what has been wronged. That of course to him is the Rubric, the grand spell he cast years ago that turned the majority of the Thousand Sons legion into mindless automatons. I really like that this is his main drive since it humanizes him so much. Not only is he upset that his work was flawed in some way and that it went so wrong that he and all who participated in it were banned from the Planet of Sorcerers, Magnus' new home with the Warp, but he truly feels grief at the loss of his brothers. He always keeps a Rubric marine close by, mostly as his personal guard, but he's always trying to communicate with him. He so wants there to be something of the man he once knew in there and the fact that he can't find any spark of that person kills him. Unlike the previous novels, this one spends more time amongst the supporting members of the cast, almost making this more of an ensemble piece. It's fine with me because I find these other characters equally as interesting and engaging as Ahriman. Amongst the Thousand Sons we spend a fare amount of time with Ctesias and Ignis. Of these two Ignis is my favorite. Unique amongst a legion of sorcerers, his mind is more wired to understand machines and mathmatics. That isn't to say he's not psychic, because he is, but he's just so different then the rest of them. He reminds me a lot of an Iron Hand marine instead. He has an automaton bodyguard named Credence who follows him everywhere and, I at least, grew to like quite a bit. Credence never speaks, but he somehow seems to be full of personality. Ctesias is more your typical sorcerer, weak and feeble, at least by astartes standards, but cunning and powerful where it counts. We also get to see the return of Asteroes, the rogue Space Marine librarian who found his way into Ahriman's service back in the first book, but now after the revelations in the last novel, is out for revenge against the sorcerer. To be honest his story felt a little ancillary to me and could have been left out without much consequence to the story. That being said, it was nice to see the end of his story arc in this, and we may even see more of him in the future. I certainly hope we do. My absolute favorite character in this though is Iobel, the inquisitor from the last novel who was hunting Ahriman. Now dead, she lives as a sort of shade within his mind. It's a really cool concept and we get to explore a bunch of cool, kind of out there ideas. She knows she's dead and that she is really just a shard of Ahriman's mind, but it doesn't deter her from trying to do what she thinks is best. There are a bunch of scenes that take place within a mind scape or spectral realm, which were always the most interesting to me. Iobel is the star of most of these, but we also get to see Ahriman explore it a bit, as well as a sorcerer still loyal to Magnus who is actively working against Ahriman. We even get quite a few scenes with the big guy himself, Magnus, who is quite important to the story. In what I think was the biggest shock to me, we even get a small scene with Tzeentch himself. Not a greater demon or herald, but the actual god of Chaos. It's a small scene, but it's very cool to see him represented on the page. The plot revolves around Ahriman attempting to right the wrongs he perpetuated with the Rubric and return his brother marines back to the physical world. This takes them from wasted Prospero, all the way into the Warp itself. There are only a few battle scenes here, with the largest being the climatic confrontation which takes up a few chapters at the end. I'm perfectly fine with this though since it gives us more time to explore the characters. Sometimes Marine stories can be too much about fighting, and when you have the thinking man's astartes with the Thousand Sons, it pays to utilize them properly like this. I don't want to spoil anymore of the plot, but it's fairly fast paced, engaging, thoughtful, and exciting. The Imperium has a very minimal presence in this story, which works since it's primarily a story about redemption and the conflict between brothers. There's an exciting cameo in here too from another Black Library author's work, which is always welcome. It really helps to create a feeling of everyone playing in the same sandbox. The ending to this was extremely satisfying, and a little hopeful. I dare say it's one of the more hopeful and emotional endings I have read in a 40k book, and you'll definitely have a smile on your face after you read the last sentence. I think out of all three books in the series, Ahriman: Sorcerer is still my favorite. It had the most creative plot structure and you really had to pay attention to what you were reading to be able to follow along. Unchanged though did the best job at fleshing out and exploring other characters in the story, even if the plot was a little more straight forward. I definitely recommend that you read this entire series if you are a 40k fan. John French is one of the most talented writers for Black Library right now. His books are always deeper then most, acting as true character studies. 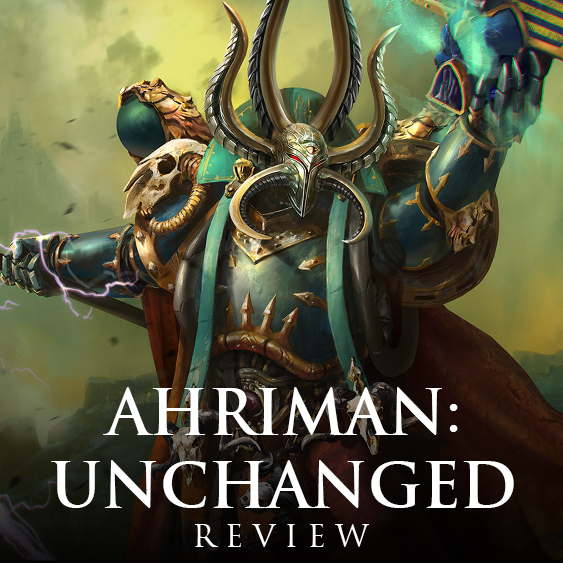 I certainly hope that we get more Ahriman stories from him going forward. There's still so much left to explore with him and John French is definitely the man to take those reins.